SMS messaging has become an expected feature in customer engagement platforms, which involves communicating information to people. Even more so when information sent to the client needs to be received immediately, rather than whenever they get around to opening their inbox on a busy Monday morning, buried underneath an avalanche of emails. Selecting an SMS provider from a pool of many can be daunting task. What should be considered when picking a partner? What are the variables? I’ll probably still use emoticons because I’m old school, and it’s much easier to type a colon and parenthesis than thumb through emojis –I digress. An important aspect of the new General Data Protection Regulation (GDPR,) which is easily overlooked, is potential liability from third parties who handle your customer data. If a data breach is caused by a partner, and your customer data is stolen, accounts are hijacked, or any other harm is done, substantial fines may be on their way –to your company. We often see client support packaged into software products, whether it includes general support tickets, to live chat, to dedicated account managers. And it comes with a cost to the software publisher, which is often passed on to the clients. As product features expand, support tends to suffer, with reply times increasing, quality of support declining, and costs expanding to solve service issues quickly. Eventually, the personal touch of client support fades. SMS has some tricks up its sleeve. While familiar to most as a simple communication tool, SMS also provides solutions for both confidential and time sensitive situations. This is where flash SMS comes into play. How Database Maintenance Makes SMS More Effective? It’s often that we are asked, “what is your average delivery rate in (fill in the blank) country?” People usually expect an answer like, “98%.” Yet cost efficiency and SMS conversion is more important than a percentage number; without context it doesn’t mean anything. The more important question pertains to how delivery rates are calculated. Let’s point out that there are mobile operators in some countries that do not send delivery reports, or if they do, they are unreliable. Is the delivery rate statistic based on messages sent and the number of messages that received a “delivered" status? That is the most common and brutally simplified way to calculate delivery rate. First of all, in fact, it is best practice to start with clarifying whether or not the mobile number databases contain phone numbers that are deliverable. How Is the Actual SMS Length Calculated? SMS routes and connections are the core of delivering SMS messages. It’s like a neocortex; where connections help SMS messages move between endpoints and applications. Also, similarly to connections in the brain, there are stronger and weaker connections. Stronger connections are shorter, meaning less mid-points, or none. Weaker connections have multiple mid-points where information can get lost. As with any service, product, tool, or feature used, certain terminology comes along with it. This can get quite confusing when the terms used seem familiar, but are used to describe events that aren’t. Throughput is a term used to describe how many messages can be sent per second. For example, a throughput of 10 messages per second suggests an SMS connection can submit (and receive an acknowledgement) for up to 10 SMS messages per second. With Money20/20 on the horizon, we’ve taken a moment to step back and try to really understand the challenges FinTech companies face. Note: This is article #3 of our GDPR awareness series. Read about data processing and the 3 pillars of GDPR as well. As May 25th is only a few days away, it’s important to review all systems and measures taken one last time. And, if you haven’t yet, let your customers know about them, too. Note: This is article #2 of our GDPR awareness series. Read about data processing and customer communication as well! The subject of the new European privacy protection laws has many of us confused about the purpose of rules within the legislation. Note: This is article #1 of our GDPR awareness series. Read about the 3 pillars of GDPR and customer communication as well. The boogeyman creeps closer and closer as the 25th of May looms, but don’t fear, it’s not as bad as it may seem. GDPR takes effect, but it’s still okay to process (obtain, transmit, handle and store) personal data. The ‘why’ and ‘how’ just got a bit trickier. Last week, Lauri wrote a good piece about keeping things real, because businesses have simple business models at their core. As one of our values, simplicity has led Messente to build a reliable and powerful SMS API and user authentication API for businesses and brands to communicate with their customers globally. While we pride ourselves in doing global A2P SMS and 2FA very well, one of our sister companies, 1oT, uses a similar methodology of simplicity to do global internet of things (IoT) and machine-to-machine (M2M) connectivity really well. Over the years, I've had the good fortune of talking to and doing business with many entrepreneurs and CEOs from a variety of industries. Some are first-time founders of small startups, while others are amazingly experienced serial entrepreneurs. Many of them are extremely successful in what they do. So naturally, while listening to them talk about their businesses, I've always tried to spot any fundamental takeaways –the small drops of universal business advice distilled from those hundreds of conversations. Over the last few months we’ve been setting the direction of our Omnichannel messaging API and our development team has started working on it. Considering transparency, we wanted to share the progress we’ve made on the API and give our clients something to look forward to, as well as helping clients prepare their systems for the next generation of our A2P messaging API. “Grey routes” is a loosely used term in the telecommunications industry. Frankly, the industry-specific meaning of grey routes is useless to most of our clients. Brands and businesses send messages to their customers and they expect those messages to be delivered, which is what our SMS API does well. However, it’s important to understand the premise of grey routes, because they affect SMS service quality, an important topic to us and we hope is important to businesses that use A2P SMS APIs. Our development team is always hunkered down, working on our APIs to create better communication and verification products for our customers. 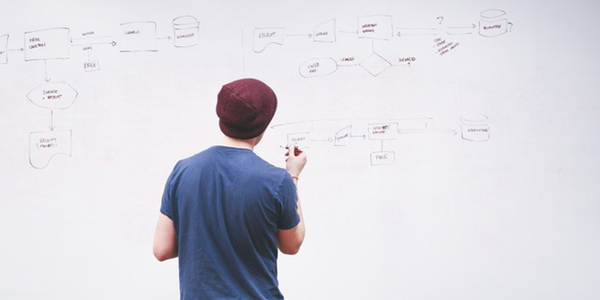 While most of our work is on the backend –things customers don’t really see –the work shows. Last year, we made major enhancements to our verification and two-factor authentication solution, and we introduced Verigator, our 2FA mobile app. This year we’re focusing on omnichannel messaging (more on that later,) but first we’re going to give our online dashboard an upgrade –an upgrade focused on even more transparency and user experience. Let’s face it. Two-factor authentication is still widely under-used. Google painted an alarming picture: 90% of its Gmail users haven’t enabled 2FA in any form. That’s nuts. Gmail has 1.2 billion active users and most of them don’t use anything more than a password to protect their accounts. But email accounts aren’t the only concern –what about everything else? Internet users average (globally) over 90 online accounts. Americans have an average of 130 online accounts and people in the UK have 118 online accounts. It only takes one hijacked account or account breach to have an impact on someone’s life and become costly for businesses. Businesses know they must put in the effort to protect their users –and GDPR mandates it. Yet UI/UX developers and product owners walk a fine line between user experience and securing their customers. Brands and product managers adopt SMS messaging because it has become one of the most effective ways to communicate and connect with customers. For example, Ad Exchange recently reported that online retailer Boxed.com experienced 100% open rates and 20% click-through rates with SMS. We're back from Mobile World Congress –the largest mobile technology event in the world –and it's time to categorize all the bits of information acquired during the roughly 60 meetings our team collectively had in Barcelona. We shipped part of our team to Barcelona this week to connect with the global mobile tech community, showcase our messaging platform, and spot trends in the global SMS messaging industry. The humble SMS is a widely used tool and as such it is no miracle that municipalities use it widely as well. With high delivery, open rates and the majority of SMS opened within the first 3 minutes, there are few other means of communication that can reach people as fast and as reliably. Not to mention that the SMS works with any device, so recipients don’t have to have an internet-connected smartphone. The enterprise messaging space is full of innovative solutions. Some of them find their place in the mix of communication channels. Some of them quickly fade away and make room for others. While Facebook Messenger has transformed how small businesses communicate with their customers, the short-lived MMS is one of the most notable technologies of the past that did not live up to expectations. It’s a well-known fact that without logging we don’t really understand if our systems are functioning properly. Or worse, if something goes wrong, it’s next-to-impossible to understand why. However, today’s software architecture is more modularized as opposed to a more monolithic approach employed in the past. Individual applications are now often isolated into application containers (e.g. LXC, Docker) to decouple complex systems into more easily manageable chunks which can be easily deployed, replicated, secured and provisioned. Attention! We’re making significant upgrades to our APIs and there are technical updates that may affect service. Please read this to see what you may need to do to avoid any lapses in service! While persistence in sales is key, there is fine line between following up a few times to make sure the message was received, and bombarding someone’s inbox or phone until they flat-out refuse to work with you, or block you. The buzz and energy of startup conferences shows, as nearly everyone you meet is excited to talk. There wasn’t a person that I spoke with at Slush that didn’t have a great story to tell, or listened to what I had to say about Messente. As regulations like the General Data Protection Rule and the new Payment Services Directive roll in, technology departments reassess the security tools they currently use and try to understand which new tools will be deemed necessary. Regarding new tools, it’s fair to ask, “do we build our own, or do we seek out a partner and buy the tool." Recently, I’ve had several discussions about company culture. And here’s a common question: How do you build a culture that supports growth and create a workplace that everyone’s happy being part of? In today’s world, it feels like the technology changes faster than we can keep up. As technology becomes even more ingrained in our lives, it’s obvious, that for our own good, regulations need to evolve as well. And it’s extremely important that business owners and leaders understand new regulations to adapt in the best way possible. With Slush coming up in about a month, it’s a good time ponder the purpose of large startup conferences. Many entrepreneurs head to conferences, like Slush, around the world and throughout the year looking for investments from venture capitalists and angel investors, yet there’s a lot more to gain from startup conferences. Think about it: there will be over 17,000 motivated and creative people in one place at one time. Get creative and gain as much as you can out of the experience. I’m excited to announce that this month brought some well-deserved recognition for the people at Messente, as we reached high rankings in a couple “top company” lists in our industry. The second Payment Services Directive (PSD2) is less than three months away from enforcement. While the regulation’s text is lengthy, a key component of the law is its extended reach in comparison to the first directive. PSD2 applies to all payment service providers and affiliates, including account information service providers and payment initiation service providers. In addition, the law applies when at least one part of the transaction is in the European Union. This means that payment service providers and their affiliates outside of the EU must comply with the law when the payer is in the EU. The additional geographical reach guarantees the same level of security expectations for all EU residents regardless of the location of the payment service provider. Messente’s two-factor authentication mobile app is officially here for iOS and Android devices. Over four years in the making, it was finally completed in April 2016. As technology became more integrated into our lives, personal data, security, and privacy have been a hot topic. Last January, the long process of creating and agreeing on new legislation designed to reform the legal framework for ensuring the rights of EU citizens to a private life was completed, and the General Data Protection Regulation (GDPR – Regulation (EU) 2016/679) was born. We’ve seen all kinds of countries and market situations at Messente –from Europe to Latin America, to Southeast Asia. The telecommunications industry landscape is unique in every market, but there are patterns. We’ve developed solid APIs for global SMS messaging and two-factor authentication, which are currently part of processes for hundreds of companies and facilitate thousands of transactions every day. Yet we aren’t stopping there. Effectively communicating with customers and securing customer account access online are two aspects of business technology we focus on. While there’s much more to business technology (much, much more,) these are the two areas which we strive to be the best. That’s why we keep developing our tools to address evolving needs in the areas which we specialize. Our SMS API connects with various software which send requests to deliver messages to millions of devices. Yet as no software is perfect, there have been cases where we have received requests to send an unusual number of messages from one account. Typically, this is a clear signal that a client’s system has a glitch and is sending messages that they did not plan on sending. While our goal is to deliver every SMS, we have a system in place to prevent looped messages from occurring. The irony here is uncanny. 8tracks, a social internet radio service, recently announced a data breach, losing a copy of their user database, which includes email addresses and passwords. While 8tracks ensures their users that passwords are encrypted, hashed, and salted, they still recommend that users change their passwords with their service. Their CEO also moved on to explaining that their (over) 18 million users “refrain from using the same password across multiple sites,” use a password manager, and user two-factor authentication. Unauthorized access to accounts in the online trading industry should never be taken lightly and definitely leads to malicious or criminal activity, which not only concerns personal user data, but also financial transactions and the safekeeping clients’ money. In the series about sales research, I touched upon allocating about 30% of your research time on finding new ideas and possibilities around sales tactics. But how do you actually do it and what do you look for? To the bank, credit card company, and investment firm I work with: I trust you. I really do. If I didn’t, I wouldn’t put my hard-earned money in your hands. While I’m not a Certified Financial Analyst, I am financially savvy, so I understand that we have a mutually beneficial relationship. From a high-level, banks use the money I deposit to sell loans and invest in other financial instruments. Credit card companies make money on interest charges, other fees, and transaction fees from merchants. The brokerage firm makes money through fees on my account. On the other hand, all I expect is that you are honest about your services, provide returns, and keep my money safe. Centralization /(sɛntrəlʌɪˈzeɪʃ(ə)n/ noun - the action or process of bringing activities together in one place. In the era of globalization and communication through technology, businesses no longer have borders and it's very common for companies to offer services from Germany to Zimbabwe, in multiple markets, and different continents. However, offering services in multiple countries leads to cooperating with a longer, more complicated list of partners. For those customers who choose not to integrate our API into their systems, Messente provide an option to send SMS messages through our dashboard via our web tool. SMS messages can be sent to individual phone numbers, or to bulk groups --here’s how it’s done. Despite the straightforward question, comparing services objectively can be very complex, as they cover a wide range of specifics, often requiring specialized knowledge. Luckily, there are several best practices to follow. Do you use the same password for multiple online services? I know I did. I also used to have a list of about five passwords with various complexity, which were used depending on the service. Then, I changed my behavior. Using the same password (or pool of passwords) is definitely not secure. If your password and username, which is usually your email address, leaks from one web service, all other service using the same combination are immediately compromised. The idea of vendor or supplier consolidation is not new, although it tends to be a fad every few years. It’s as if every time a new type of product or service is created, or variation thereof, businesses onboard a new vendor partner. Eventually, someone in the business (usually in accounting) realizes that they’re paying a lot of different bills for similar products and service, and sends the business down a path of consolidation. While the benefits of consolidation seem obvious, drawbacks do exist, especially with software partners. This is the third and final installment of, “Digging for Gold,” thoughts and ideas on B2B sales research and prospecting. If you have not yet read part 1 and part 2, they’re quick reads, so catch up! This is a continuation from the previous article and focuses on the methods of research and how to find leads. Messente meets Zapier - integration to hundreds of web services in minutes. Our collection of API libraries now include official Python language support. The number of different industry events has grown a lot over the last years so picking the right one to attend can be a huge task. From location to pricing and from speakers to booth options - there are a lot to consider before committing yourself to a selected few to tackle. Past years have raised quite a few alarms for a lot of people and making them question the level of security of their online data. Just recently over 100 million LinkedIn usernames and passwords stolen in 2012 appeared online and one of the largest online dating sites AshleyMadison.com suffered a large scale breach with 25GB of critical data including user information was stolen. These are just two out of too many hacks that clearly demonstrate how easy it is to take control of your personal data. Messente is coming to ConhIT - Europe’s leading industry event for healthcare IT held in Berlin from 19 - 21st of April. SMS is a great tool for marketing campaigns - it’s cost efficient, with one of the highest conversion rates, and it’s super simple to get started. That all sounds great, but it is vital to monitor the traffic, as well to understand how did the users carry out what you planned for them to do on your site. According to Gartner by the end of 2017 around 50% of businesses will choose cloud-based services as the preferred option for authentication (up from about 20% today). Starting from today you can make your login to Messente a lot more secure by enabling 2-step verification using your phone. We’re very excited to bring you our latest upgrade to Messente’s 2-step verification products - the phone number verification widget. It’s a tool which makes user authentication and phone number verification completely plug and play for developers. Based on the latest surveys on retail consumers' intentions and reactions we offer three simple thoughts how to be top of mind for the last decisive weeks of this year’s Christmas rush. You may have already noticed that Messente's web interface had a major facelift today. Off with the dark design and on with the modern fresh look. Let's admit it - sms length calculation is complicated. This is why we made an open-source SMS length calculator library. Take a moment and think about the last time you had very positive customer service experience. After Apple introduced a modern smartphone to the world in 2007, having internet connection and a camera on your phone has become a standard on smartphones. This is where the downfall of SMS messaging started. Recent high-profile data breaches have become a permanent concern to many private and public organizations. One of the key trends of 2015 for web apps and services will likely be a much wider adoption of 2-step verification. For any company customer service and keeping all users happy is a big priority. Which is probably why a lot has been written about it. Security is a growing concern to many companies when their clients need to login and handle confidential information. The more data we use online, the more possible data leaks there is. Did you know that the number of online searches like “perfect christmas present“ or “dress for christmas party” start increasing in numbers right after Halloween? Traditional Person To Person (P2P) messaging saw a decline for the first time last year, conversely to quickly growing popularity of various Over The Top (OTT) messaging services like WhatsApp, Viber, iMessage etc. Messente team visited one of the largest postal services conference in Europe called POST-EXPO 2014 in Stockholm. In Messente we like tools that are dead simple and easy to integrate. Deep down in Messente’s laboratories our team of scientists work around the clock to provide you with new and groovy ways to reach your customers and get more of SMS messaging. A fairly smart guy, Albert Einstein, once said that things should be made as simple as possible… but not any simpler. Here at Messente we know how important it is to manage authentication within your applications, while keeping the logic clean and possibly automated. SMPP has long been industry standard for sending SMS over the Internet but HTTP API’s have quietly made it’s way to the top. We all know the importance and quality of interaction brands can receive by communicating with their customers via SMS message. Since SMS messaging helps many to connect with their customers around the world, also standardized phone number format is used for sending SMS internationally, thus helping you to reach mobile subscribers globally. Fine tuning SMS communication for your brand. Have you noticed that in past few years we hear less and less about personal computers and laptops, while at the same time the mobile industry updates are big part of our daily news? SMS is so well known and often used that I think most of us take it as self-evident and really dont think about how does this little 20 year old technical feature make our life easier. In today’s increasingly connected world SMS has evolved from a conception to an enterprise necessity. Here is a short list of what you should keep in mind when requesting a sender name. Following a few simple rules will get your sender name approved in no time. There are many things at home that you could automate and make your life easier. Every minute Messente delivers a considerable number of last minute alerts, appointment notifications and booking confirmations. Have you ever wondered how many people actually own or use mobile phone? Before smartphones conquered the world of mobile phones, SMS was widely used for more than sending regular SMS text messages. Integrating Messente SMS sending API to your current framework is very easy. Here is a small tutorial to get you started with Messente API. From time to time there are problems with SMS delivery that are out of our hands and receiving one SMS multiple times is one of the most annoying one. Ability to send out notification SMS can be most invaluable to system administrators, as it allows to send urgent notifications to admins with ease. Sender name (also known as Sender ID, Originator, Sender address) is the number or name that appears as the sender of text message. Messente is moving fast – over the past year we have doubled in the number of messages. But for the year of 2014, we are excited to aim even higher. This January, live support chat was added to Messente in order to make asking questions a breeze. We are really excited about this! Margus joined Messente’s sales team earlier this week. Earlier today we launched a small update which changes the way Messente’s header looks and feels. Yesterday Imre from Nortal shared his Microsoft.NET client API for sending SMS messages to mobile phones using services provided by Messente. You have probably noticed that Messente’s archive has a brand new look and feel. We took a quick look back at 2012 seeing how Messente has evolved during the past year. Here are a few improvements. 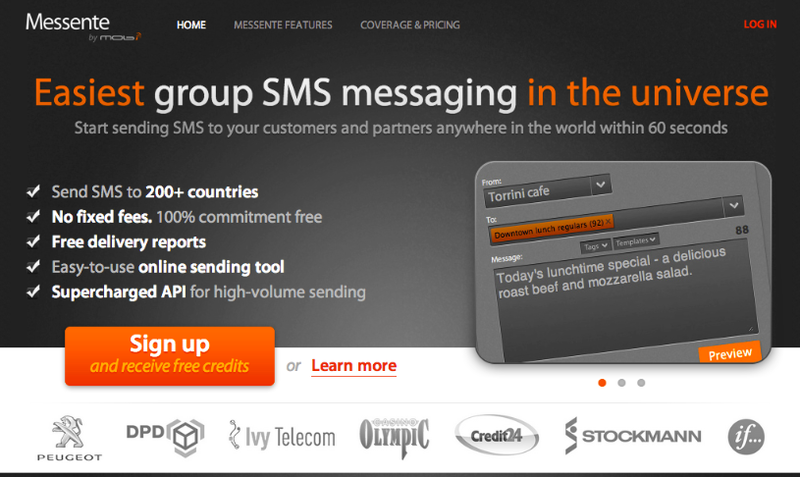 Welcome to Messente - a brand new group SMS messaging platform that enters public beta today.